It’s now easier than ever to improve the way your skin looks & feels without surgery! The Power Play combines Medical Microneedling and Erbium 1540 fractional laser rejuvenation for cellular renewal, tissue tightening, and smoothing skin imperfections. This revolutionary procedure is a non-invasive & no downtime treatment that stimulates your skin’s natural ability to produce new collagen & elastin for healthier, younger looking skin. 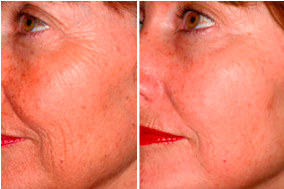 Medical Microneedling & 1540 fractional laser rejuvenation allows for treatment to deeper parts of the skin without removing or damaging the top skin layers. These state-of-the-art devices create precise and purposed micro injuries within the epidermis & dermis to trigger new collagen, tissue fibers, and as well as directing new blood flow to the skin. A series of four treatments spaced every 30 days are recommended for most. Depending on individual needs, customized plans will be recommended. Most begin to notice healthier-looking skin immediately. However, dermal collagen remodeling takes place over time, and will continue to improve for up to 6 months after your final treatment. Riva Aesthetic Dermatology utilizes cutting-edge techniques and state-of-the-art technologies for optimizing your cosmetic results.